Since the Zune 4 software was released, I have been using it fairly exclusively as my media player when using Windows. I really enjoy using the software, and I like the way it tracks and shares my recent plays. In the spirit of Xbox “achievements,” the Zune social system even issues “badges” once you’ve listened to a specific artist enough times. Unfortunately, however, the Zune software is only available for Windows, and I use Linux about 99% of the time on my home computer. I do, however, have Windows XP installed as a VirtualBox guest so I can use Windows programs like Photoshop, Internet Explorer 6 (for Web development testing), etc. I thought it would be simple to use the Zune software inside of that VirtualBox. I was wrong. 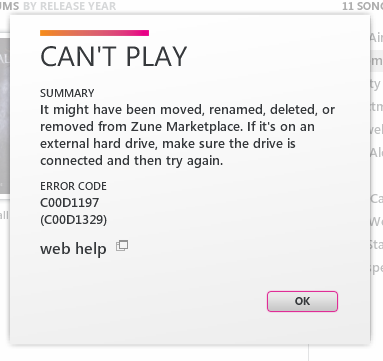 Apparently, the Zune software will not recognize media files stored in a VirtualBox shared folder. When you attempt to play the files, you will most likely receive an error stating that the file couldn’t be played, and that it might have been moved. I have found a few posts online indicating that this problem also occurs in Windows Media Player when using the same set up. I’m not sure if it applies to Windows Media Center or not. Last night, I decided to head to Google to see if could find an answer to this problem. I found a lot of people experiencing the same problem, but it took me a while to find anyone offering a valid solution. Finally, I came across a post on the VirtualBox community forums that, in turn, linked to a post in the Ubuntu community forums explaining how to setup and use a Samba share from your Linux host to your Windows VirtualBox guest. Because I do not have a static IP configured on my machine, I used the instructions that explain how to use the Samba share with WINS disabled in your XP guest. It is important to note that, when the tutorial says to “Type \\\MyFiles”, the ip-address indicated in that statement is the IP address of your machine on your local network. To find that in Linux, you will most likely need to type “ifconfig” in the terminal and look for your “inet addr.” This will most likely not be the IP address provided by your Internet Service Provider (ISP). When you mount the folder as a mapped network drive in your Windows guest (this might just be applicable if you do not use WINS), you should click the link that says “Connect using a different username.” Then, when the user dialog appears, enter the username and password from your Linux host. Once I followed all of the instructions in the post, I fired up the Zune software, clicked the “Settings” link in the top-right corner of the program and clicked “Add Folder” next to “Music” under “Monitored Folders.” I added the music directory from my newly mapped drive and clicked OK. The Zune software started finding all of my media immediately. I then started playing some of the files (as, even when it was not working properly, it still added the media, it just told me the files couldn’t be played) and everything seems to work perfectly. Then, to test further, I closed out the Zune software and re-opened it. I played some more files and they still worked great. Finally, to ensure that everything was set up correctly, I restarted my Windows guest to make certain that the mapped drive would be remapped on restart. The drive was remapped properly, but for some reason the Zune software didn’t see my files again. I opened My Computer and then opened the mapped drive and found that it prompted me for my password again. Once I entered my password, I was able to get the Zune software working again. It seems that each time I restart my Windows guest, I will need to open the mapped drive and enter my password in order to use the Zune software, but that’s still a lot better than it was before. My next step is to attempt to sync my Zune using the VirtualBox setup, but I’m not holding out much hope right now. In the past when I’ve done that, it’s been extremely unreliable. If I do get it working and figured out, I’ll try to share it here. Timely, my friend runs Ubuntu and runs Windows XP in VB as well (for Microsoft Office, he shares my passion that OO blows). I know he runs the Zune software completely fine (4.0) and he does sync his Zune as well (he owns the zune HD). I never bothered to ask him how he did it, but I will direct him to this post and see if he has anything to say about it. I’m not sure if this is a widespread problem, or if it all depends on your VirtualBox/Linux set up. Also, I forgot to mention in the post that the “file cannot be played” error only applies when you’re trying to use media that’s stored in a VirtualBox shared folder. If your files are stored within a “local” folder in your VirtualBox guest, they should play just fine (of course, they’re then completely unavailable outside of your VirtualBox guest).